Northamptonshire Police’s effectiveness at keeping people safe and reducing crime has been judged to ‘require improvement’ in the latest report by Her Majesty’s Inspector of Constabulary (HMIC). The independent inspectorate has found the county force needs to improve its approach to preventing and investigating crime and anti-social behaviour, the way it tackling serious and organised crime, manages offenders and protects those who are vulnerable. An inspection report, published today, states that “weaknesses in the assessment and allocation of crime for investigation are causing unacceptable delays”. HMIC spokeswoman Zoë Billingham said: “I am satisfied that the force is committed to preventing crime and anti-social behaviour and most officers understand the importance of taking a preventive approach. “However, poor direction to officers and assignment of tasks means the force may not be making the best use of its available resources for the prevention of crime and anti-social behaviour. HMIC found that Northamptonshire Police also needs to work better with partner organisations in its fight against serious and organised crime. 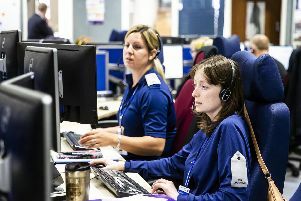 Inspectors also found examples of delays in the recording of crimes, including backlogs in the force’s forensic examination of digital evidence from mobile phones and computers, which is causing delays in the investigation of high-tech crimes. HMIC also pointed out that the large number of Special Constables often caused problems for sergeants deploying staff as they do not have sufficient police constables and PCSOs on duty to ensure they are supervised appropriately. Chief Constable Simon Edens said the force welcomed the findings of the HMIC report and were aware of the issues and challenges highlighted in the inspection. Mr Edens said: “Six months have passed since the Inspection which has given senior officers a chance to address areas of weakness and work is well under way to that effect. “Areas for improvement such as how the Force investigates crime and the way in which it tackles organised crime and anti-social behaviour are ones we are beginning to address and, as HMIC states, there is no doubting the commitment and dedication of our workforce to do that. “HMIC acknowledges good progress is now being made in the way we combat violent crime, which still remains too high, and that is encouraging. “Also encouraging is the praise we received for a number of key areas covered by the effectiveness assessment, including progress made on joint working with our colleagues in fire and our investigations into child sexual exploitation and missing people. “HMIC also noted successful partnership working between the force and other key agencies such as community safety partnerships as well as good use of body-worn video and support provided by our forensics team. Adam Simmonds, Police and Crime Commissioner for Northamptonshire, said the new chief constable would help to improve the force’s performance. He said: “The performance of Northamptonshire Police has needed improving for well over a decade and despite the fact that it has made improvements in recent years, there is still much to do as this report shows. I’m impatient to see progress and a safer Northamptonshire in years to come. “However, Northamptonshire Police has a new leader in Simon Edens, who I believe understands some of the inherent problems within the force and the county and he is beginning to take the necessary action to tackle these issues, looking at new leadership appointments and collaboration with other forces, as well as prioritising the tackling of violent crime.